Thomas Gagne, Esq. has been selected as a Top 100 Trial Lawyer by the National Trial Lawyers. 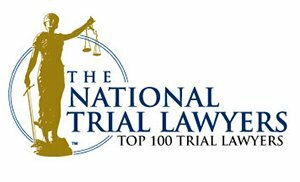 What is The National Trial Lawyers: Top 100? Membership in The National Trial Lawyers: Top 100 is by invitation only. There is an incredibly rigorous process by which attorneys are selected for this list. In order to be selected for this honor, attorneys are put through their paces in a multi-stage process. Elite attorneys are required to meet stringent peer-review requirements and pass extensive third-party independent research that demonstrates their qualifications. Attorneys with excellent qualifications who demonstrate their skills within the courtroom and beyond ultimately receive an offer to become a member. Membership is extended solely to the select few of the most qualified attorneys from each state who demonstrate superior qualifications of leadership, reputation, influence, stature and public profile. Each attorney who is selected is among the “finest and best lawyers in America,” (Case Results May Vary) according to the National Trial Lawyers: Top 100. In addition to The National Trial Lawyers honor, Thomas has been selected as one of the Premier 100 trial attorneys for South Carolina. The attorneys selected as a Premier 100 Trial Attorney by the National Academy of Juris Prudence have been recognized by the bench and the bar as leading Trial Attorneys in the Untied States. Members of the Premier 100 Trial Attorneys have satisfied stringent criteria as established by the NAJ Board of Directors. Of the 1.2 million attorneys currently active in the U.S., less than 1% are selected to receive this honor. The Attorney Offices of Thomas Gagné, P.A. is a law firm dedicated to serving injured persons since 1997. We handle auto accidents, job injuries, slip-and-falls, and many other injuries. We represent physically, emotionally, and financially injured victims in South Carolina. Our reputation as a serious, successful firm representing injury clients is the result of dedication, experience, and hard work obtaining excellent settlements and verdicts for our clients.